Diwali, the festival of lights, is one of the most widely celebrated festivals in India. It commemorates the day when Lord Rama defeated Ravana and reclaimed his throne. This festival brings the entire country together. Apart from exchanging sweets, wearing beautiful clothes and cleaning the house, there’s another tradition followed during Diwali- making rangolis. Rangoli, an art form created on the floor, using flour, colors, colored rice, flower petals and even colored sand, is made on the threshold of every Indian household during Diwali. 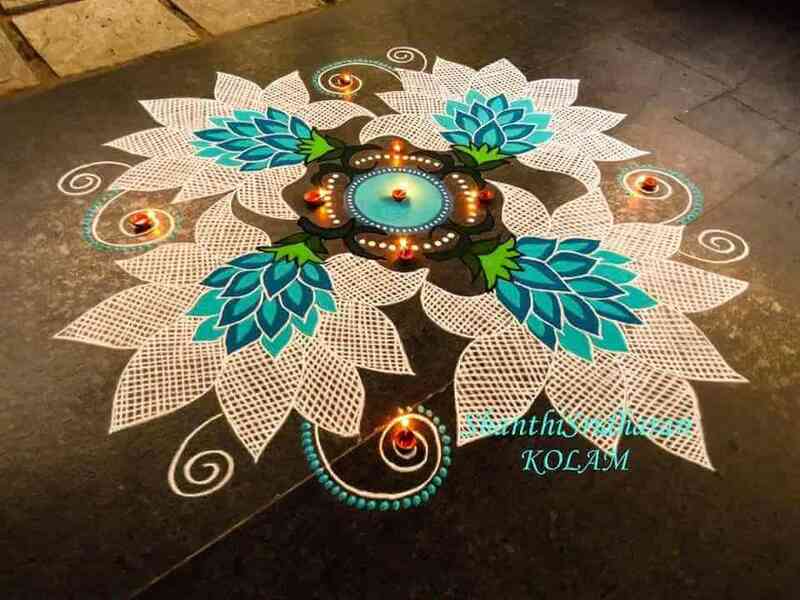 Below we have gathered some of the best Rangoli designs and ideas Diwali and ideas to inspire you. 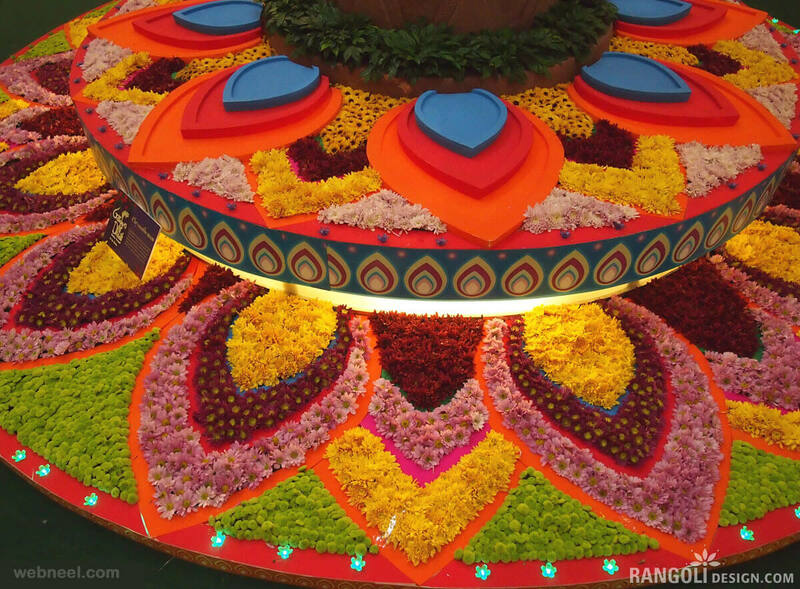 This large rangoli is majestic in the truest sense. The white appears a lot like doily. And the peacock feather design with white outline is making it stand out. 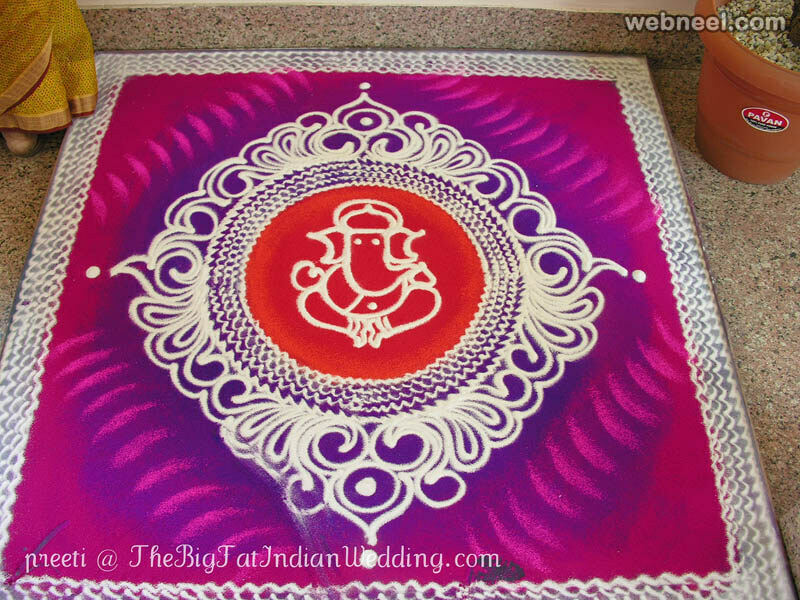 Ganesh rangoli is one of the most popular rangoli designs during Diwali. 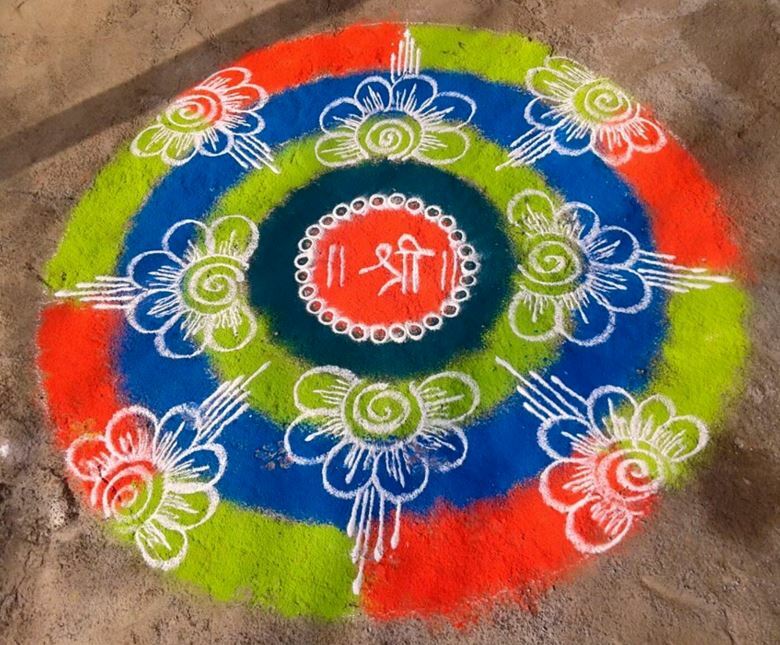 Festive colors like pink, purple, orange and red are used for this rangoli. The white outline is making the background pop. And of course, it will give a traditional look to your décor as well. 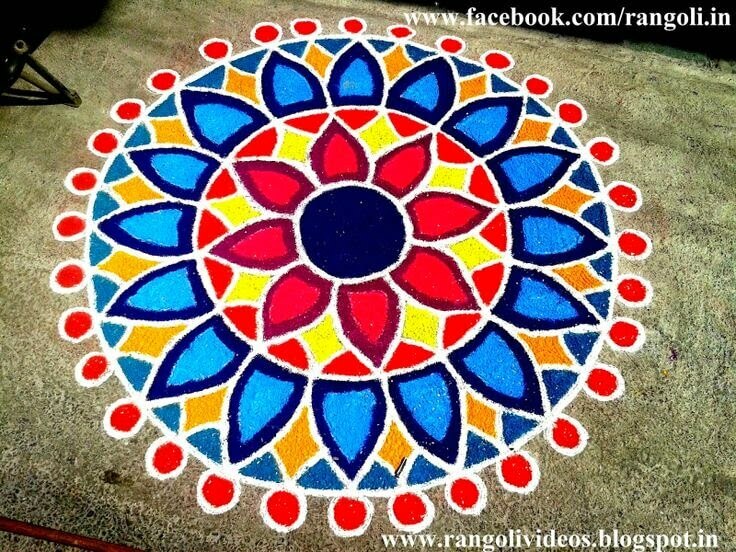 There’s no hard and fast rule that you need to use just one material for making rangoli. 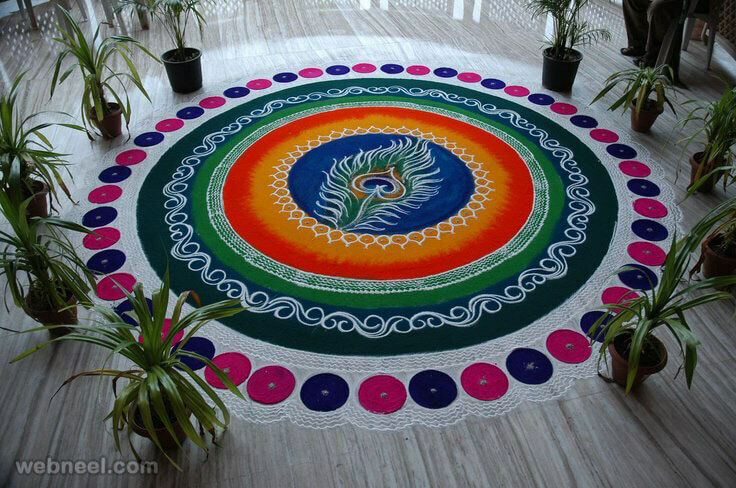 Try and experiment with different materials in a single rangoli to enhance the design. Rice and flower petals, as seen in the picture, pair really well. To make your decoration prettier, place a small sized Lord Ganesh idol in the middle. We must say the pixelated design is looking awesome. Floral rangoli is personally my favorite. 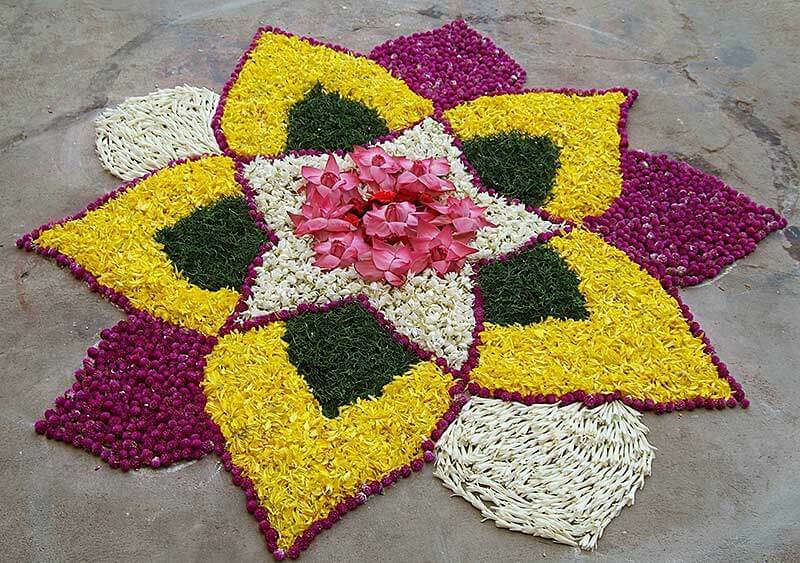 This rangoli, involving loads of flower petals, fills the house with a pleasant fragrance. And of course, it’s supremely attractive too. Peacock is another lovely theme for Diwali rangoli, that probably because the bird is associated with Goddess Laxmi. 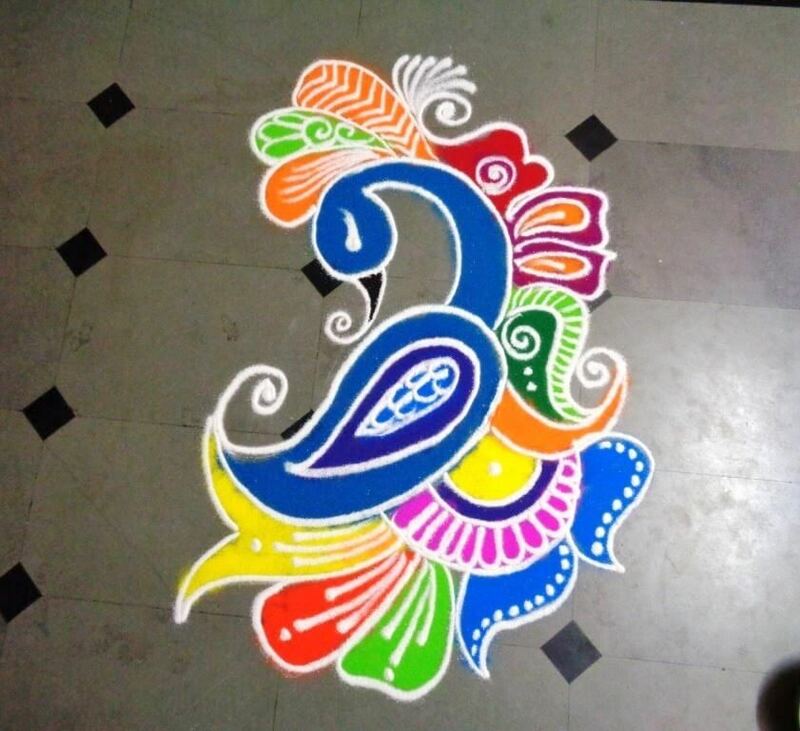 Hence, making a peacock rangoli for Diwali is considered auspicious. And if you’re contemplating the same, you just cannot ignore this stunning design. 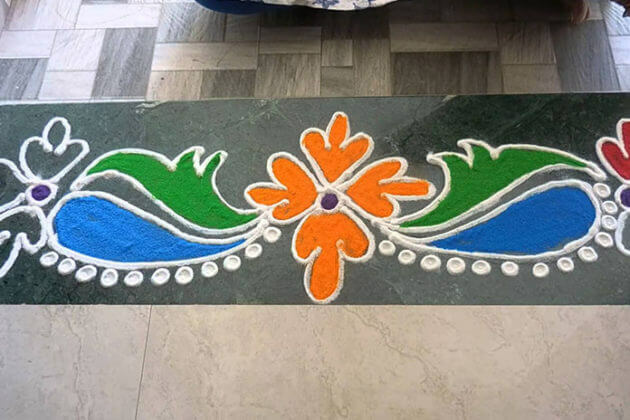 Border rangoli designs are usually made to deck up the entrance of the main door or Puja room or along the walls. And they look exemplary as well. 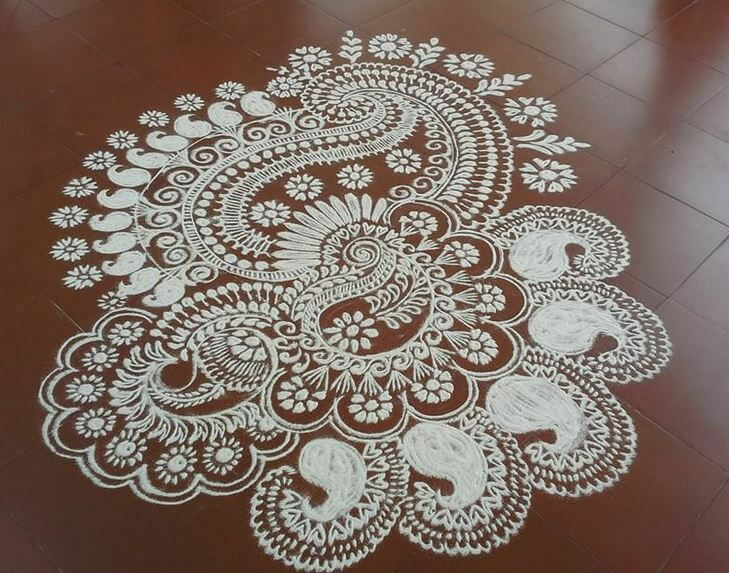 You don’t always need to go larger than life for Rangoli decorations. 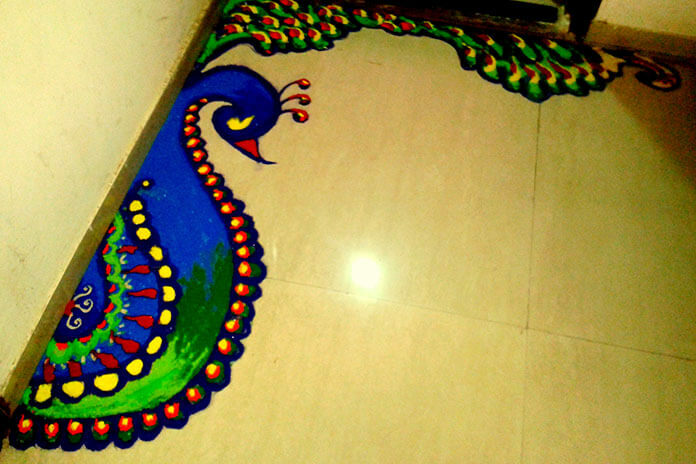 You can keep the decorations muted too, with a small, but beautiful Rangoli design. 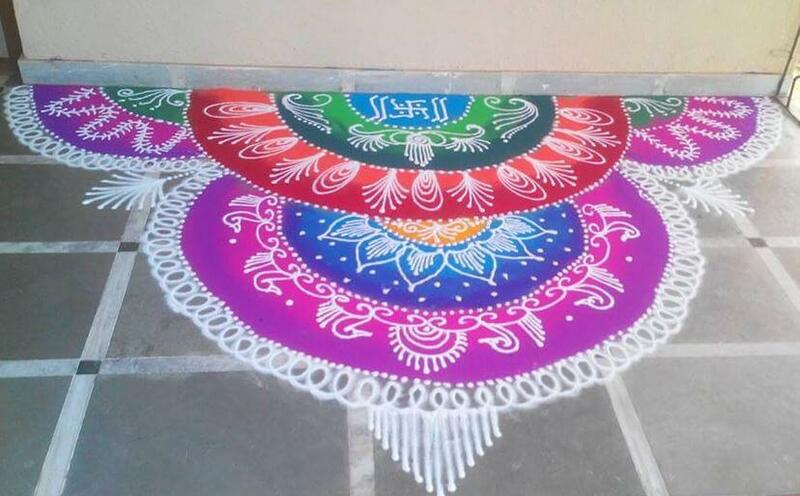 If you’re short of outdoor space for rangoli decoration, you can try making one on the corner of the floor. These look excellent on the entrance or front gate. And are relatively easier to make too. 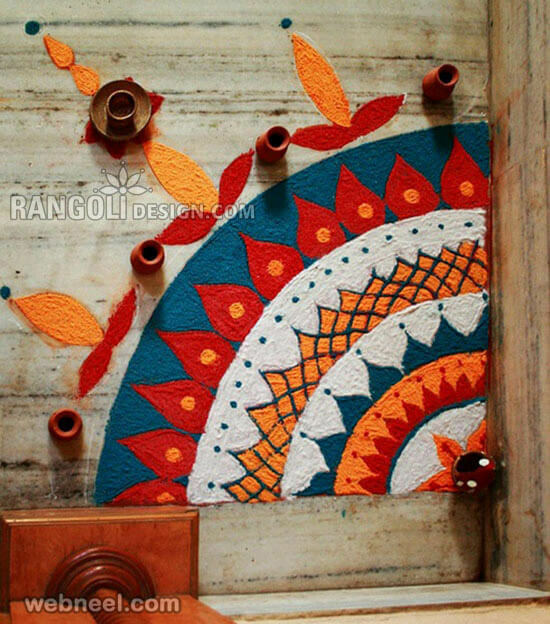 The oh-so awesome color combination of this rangoli is making the entire pattern stand out. Honestly, we’ve never seen anyone opt for such an unconventional color combination. You can even consider making Kalash or pot rangoli at the entrance of the house. Make it freehand first and then add tiny dots and stylish designs to customize the design. 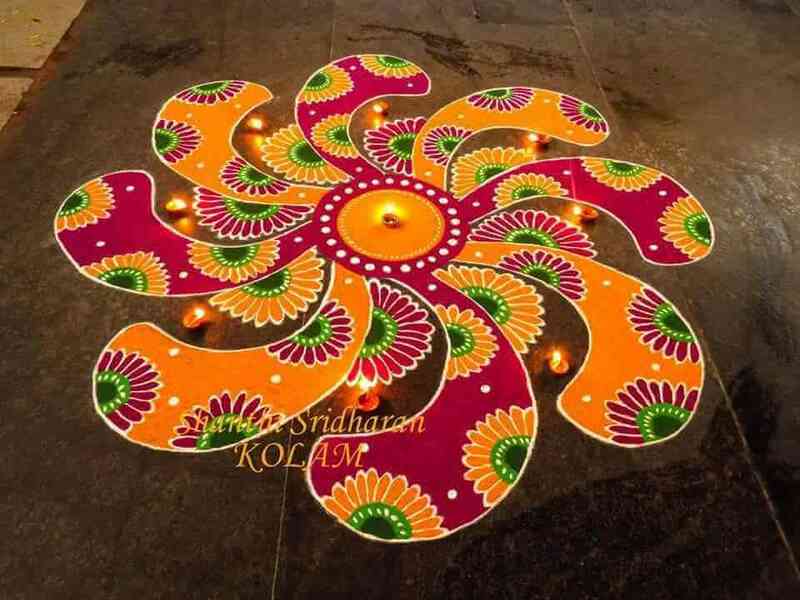 Kolam rangolis are basically geometrical patterns, drawn around the pattern of dots. These designs can be made using chalk, chalk powder, rice flour or even white rock powder. So instead of going for traditional rangoli, you can go for this one. Freehand rangoli, requiring just a few careful and precise strokes can help the budding artists showcase their brilliance during Diwali. Let your design reflect the rich culture and heritage of India with this bright and beautiful rangoli design. 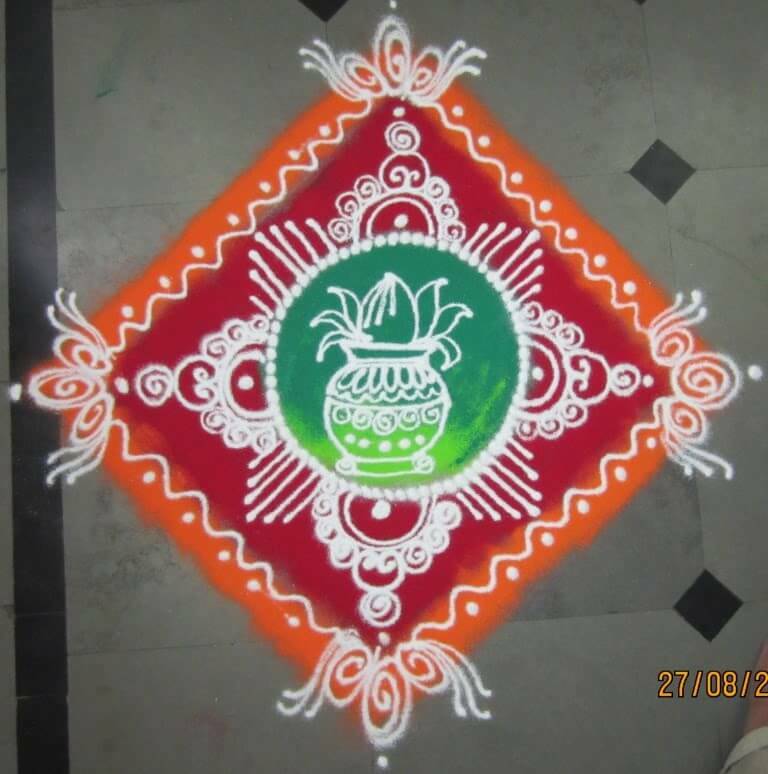 Here’s another neat and pretty rangoli design for you. The ‘Happy Diwali’ wordings are usually put for office rangolis, but you can feature the same in your house too. Here’s another beautiful Lord Ganesh rangoli design. 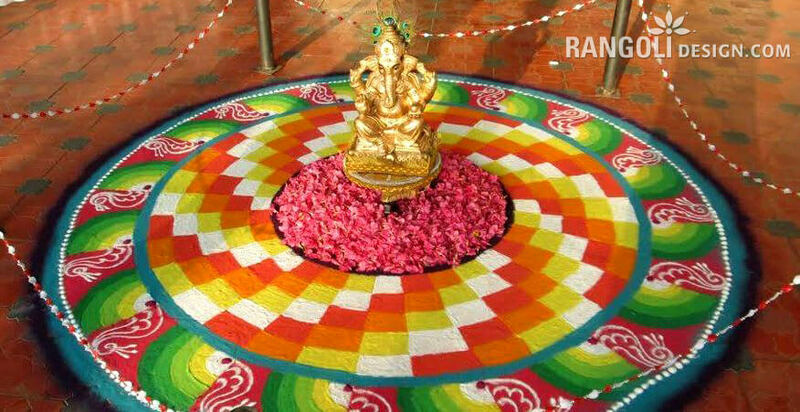 The lifelike image of Lord Ganesha is making the rangoli stand out. This bright and gorgeous rangoli, made by combining shades like pink, purple, red and green aptly matches the fervor of the festival. 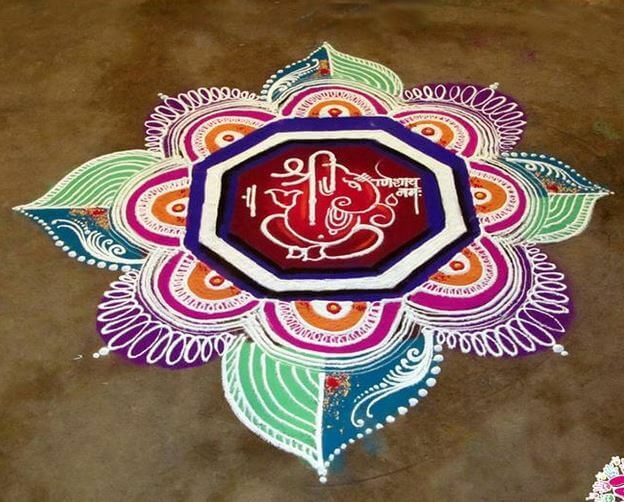 This intricate floral rangoli design is beyond beautiful. The diyas are placed strategically and the color orange is used perfectly. Curved rangoli designs are used mainly for thresholds or entrance. The interesting design is traditional, but still looks beautiful. 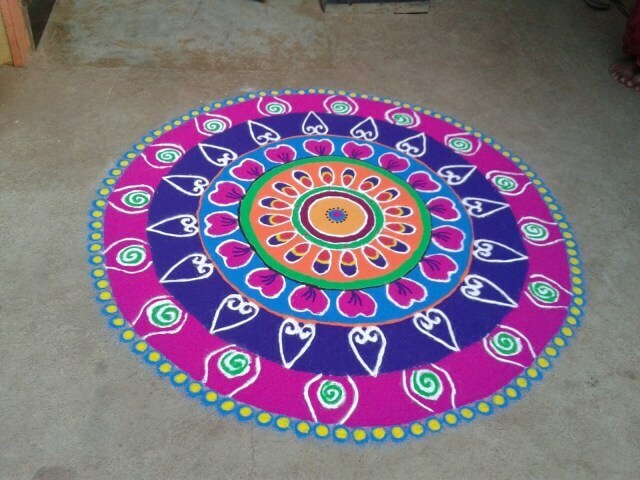 If you want, you can even use plastic props for your rangoli decoration, as seen in the picture. 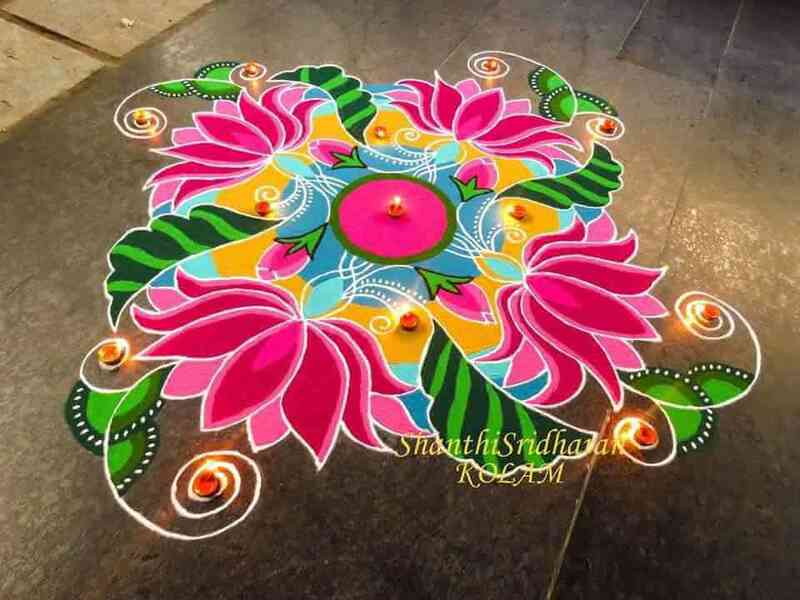 The plastic petals used for this rangoli are giving a 3D like effect. 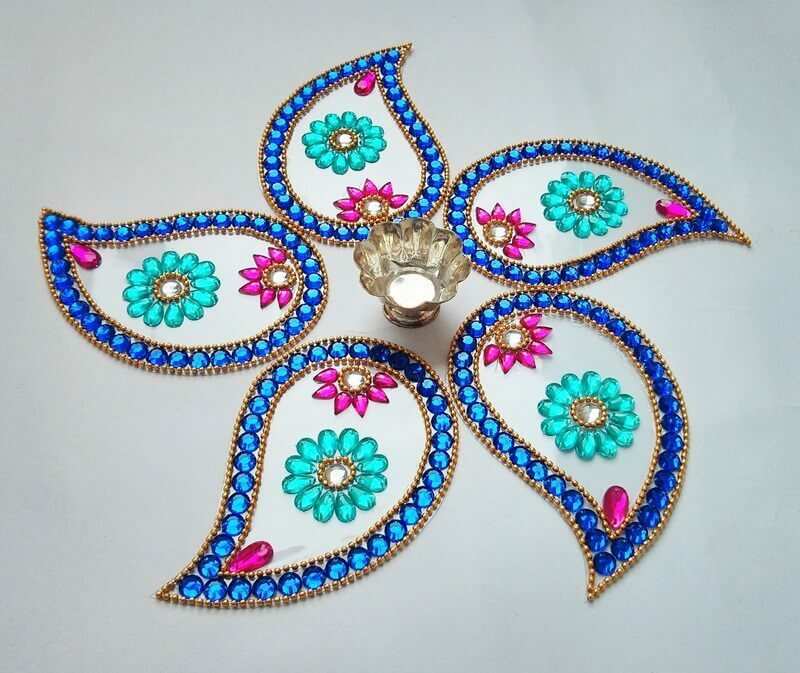 Kundan rangoli or floating rangoli are not just fun, but can be placed anywhere you like. You don’t need to restrict it to a particular place. You can put it any where you like. Kundan stones are generally used for making floating rangoli. 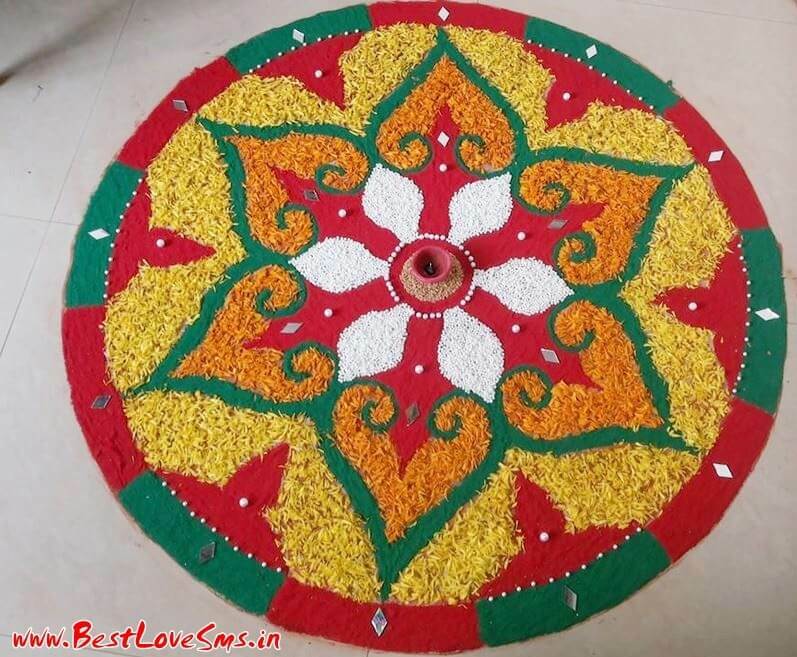 It’s said that Rangoli originated from symmetric rangoli designs. 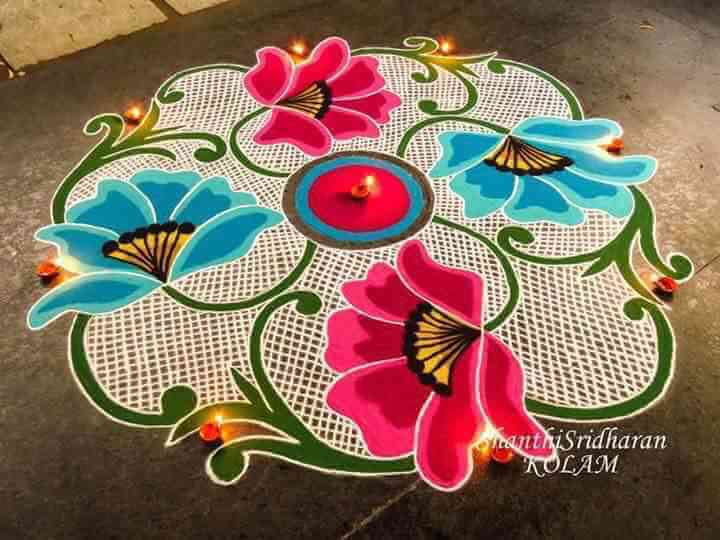 But with the passage and transition of customs and culture, people began customizing rangoli patterns. 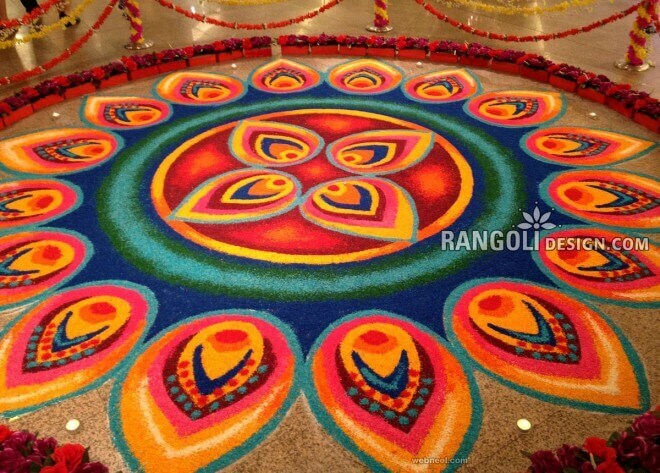 We particularly love the oval edges of this rangoli. If unconventional and unique is what you’re looking for this year, go for this supremely beautiful lotus rangoli design. 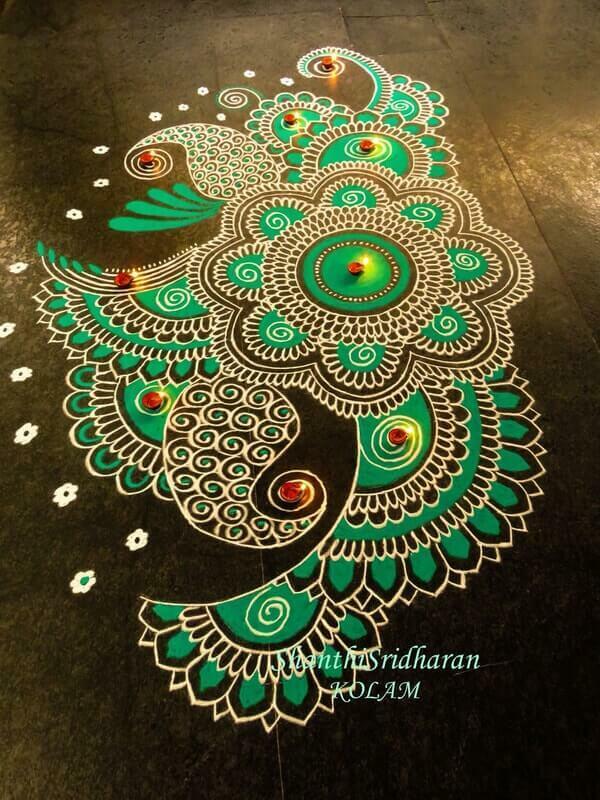 Here’s another magnificent rangoli design for Diwali to inspire you. The intricacy of this design is simply mind blowing. 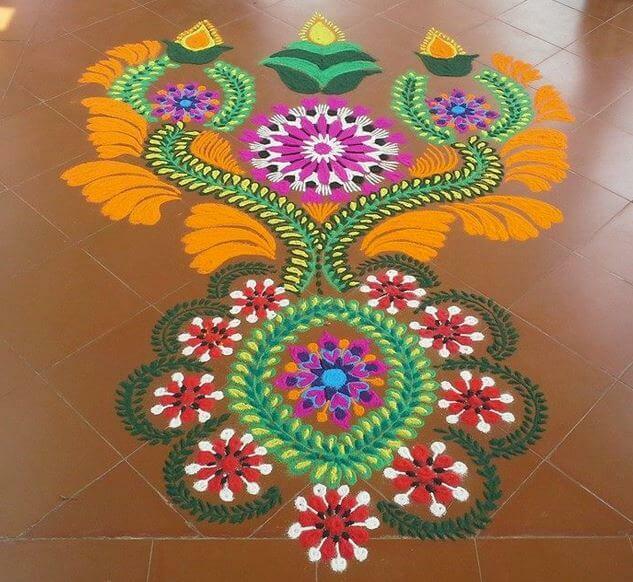 Here’s another unconventional and beautiful color combination used for rangoli design. The design is fairly simple, with just petal pattern. But the color combination is making it pop. 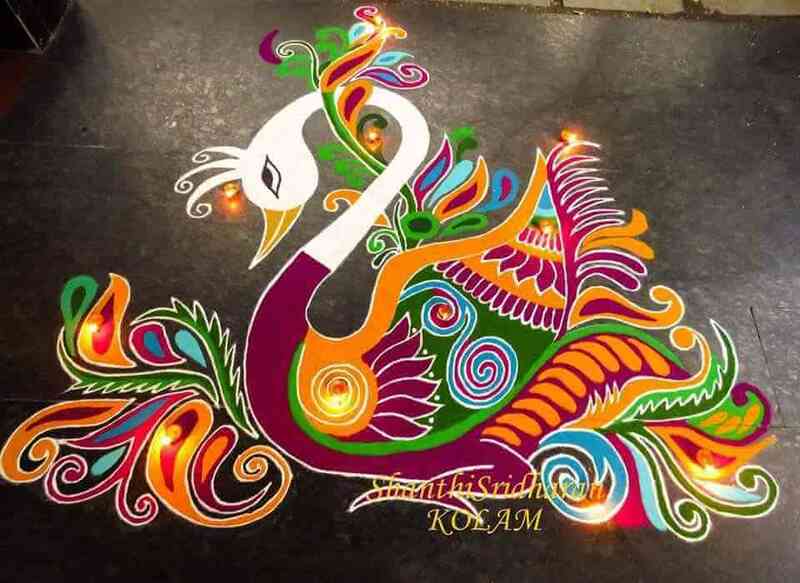 Have you ever seen a swan rangoli before? It’s a first for us, for sure. The colors used are simply mind blowing. 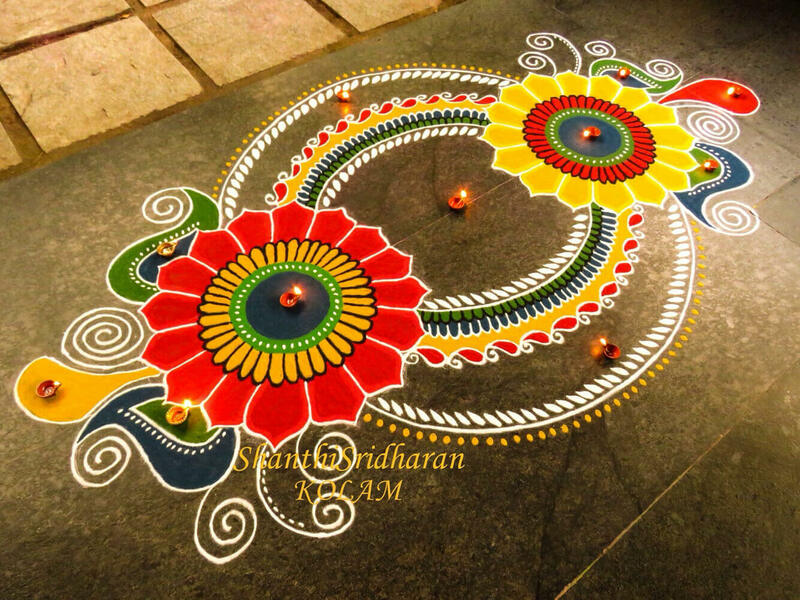 This rangoli reminds us of the firecracker called charkhi we burst on Diwali. No color combination can look more traditional than red and yellow. While it suits all occasions, it particularly looks amazing during Diwali, when the lamp flames emit red and yellow color. 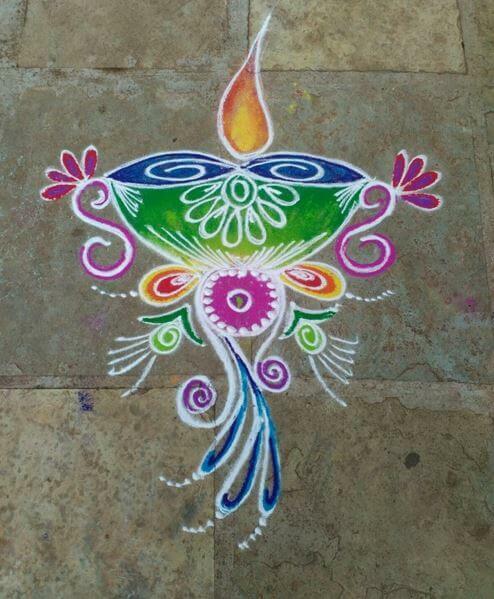 It’s seldom we come across non-traditional colored rangolis for Diwali. But after seeing this image, I’m sure several of our readers will follow suit. Diwali is the festival of lights, when hundreds of diyas or lamps illuminate the roadways and houses. 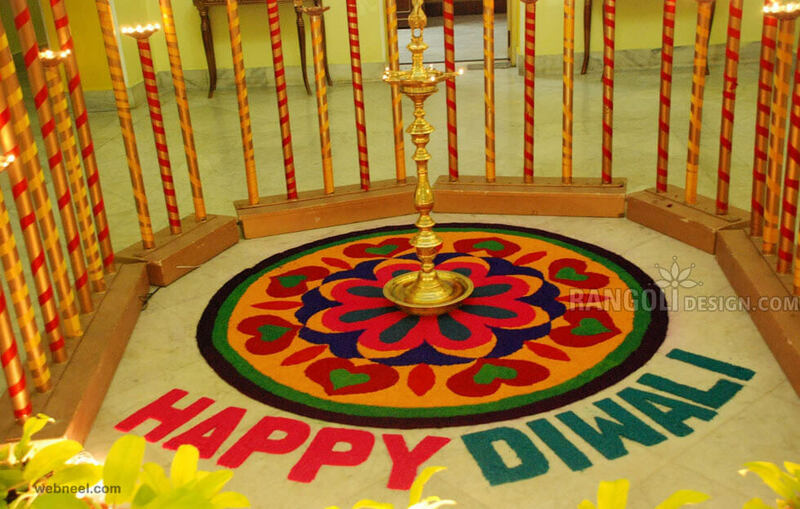 So how can you not incorporate a diya or lamp rangoli in your decoration. 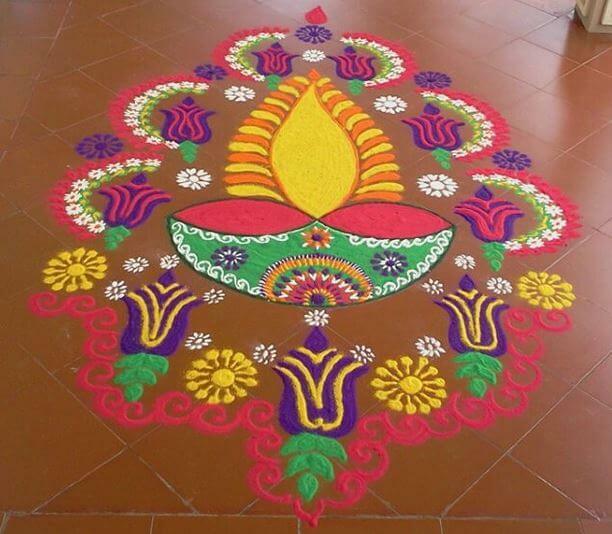 We’re sure you must be pleased with our collection of Rangoli designs and ideas for Diwali. Don’t forget to share your work with us by commenting below. We’ll be waiting.